nt at all times, virtual ‘products’ are ‘bought’ only for use when needed. We cannot draw an impression of value just from the physical look and feel – value is only revealed through the customer’s usage experience. For this reason, a provider of virtual services has to understand 3 things: the technical solution, its usage in context, and the subjective experience of customers in that situation. But the challenge is even bigger. With the new technologies ahead, it will be necessary to predict usage and adjust the product to maximize value or create an optimal win-win situation. So ‘quality monitoring’, with value in mind, has to adapt the value orchestration to the demand. In a ‘value’ scenario, it acts as the adjustment element in a content provider customer relationship. This task, however casts light on another aspect of future ‘value’ dimensions: adjustment, or in other words, learning capability. Just like before, planning and monitoring meet to allow us to evaluate the delta i.e. the offset between both. But, in future, ‘value optimization signals’ will immediately be needed to provide feedback, to learn from the feedback, and to adjust the cycle. Therefore the key question is: ‘how efficient is the learning process’? 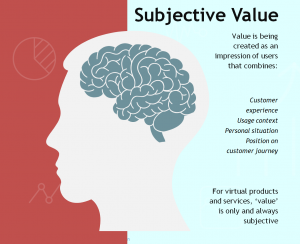 How well does the ‘value generator’ understand what drives value perception among users and how well does a service adapt to changing contexts and situations? Looked at from this angle, it is impossible to separate the idea of ‘value optimization’ from the idea of learning, and the first only makes sense with the second. However, the development and application of machine learning, and making that the reference to ‘learning’ in our context here, casts doubt on the older concept of ‘error-free’ as a synonym for ‘good’. In machine learning, an algorithm that creates error-free results would be considered a trap. That means ‘sudden death’ for the relevant algorithm, which becomes extinct because of the exaggerated precision. A value system that adapts to changing conditions should never be error-free because one cannot adapt without making errors along the way. One thing that can be understood from machine learning is that the relevant question is not whether something is ‘good’ or ‘bad’, but whether we make the right kind of mistakes at the right point. The answer will consider both the learning technology and the effective subjective value, as measured in terms of the customer’s experience.